There comes a time in every girl’s life when she feels the need for a makeover. This change of look can either be discrete or dramatic, depending on your objective. Most of the time, you’ll want to change your hairstyle, and highlights are an extraordinary way to do so. 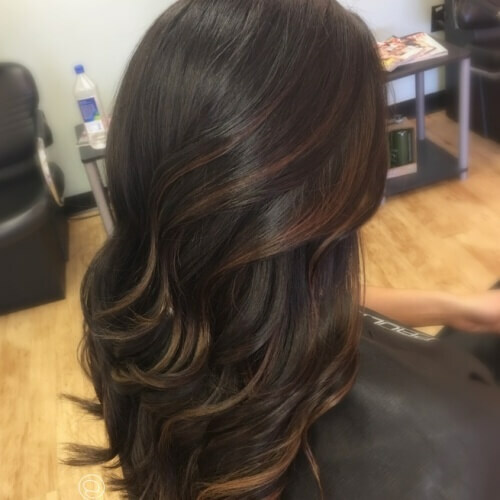 If your hair is a deep choco color, then check out these ideas for highlights for dark brown hair as inspiration! Our first idea is a wonderful choice for women who want just a bit of light brought to their dark chocolate locks. 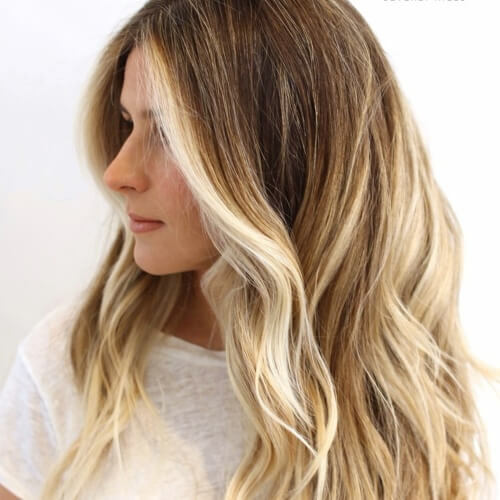 To obtain this effect, go for a set of highlights in a shade or two lighter than your base color. Want to stand out through softness and simplicity? 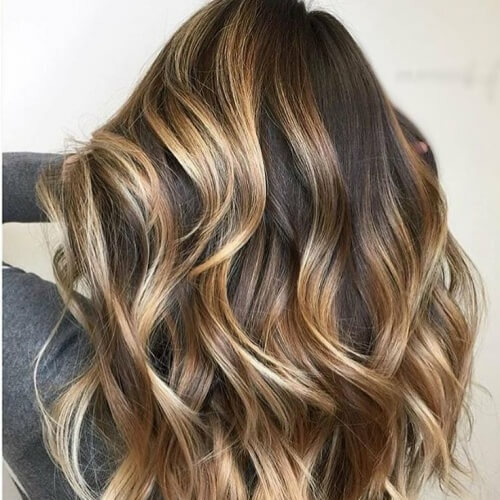 Consider blending your highlights with a balayage coloring technique. When the two methods are combined, you get a heart-stopping hairstyle that smoothly blends with the color of your roots. Bring all the sunshine you can imagine to your hair with a professional blend of highlights and lowlights. This mixture not only accentuates your individual strands, but also spices up your overall hairstyle in a classy way. 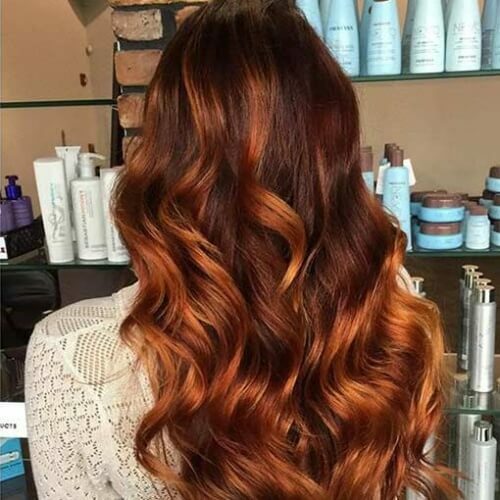 Copper is one of those unique hair colors that is spicy yet easy-going at the same time. Although it may initially seem to be a paradox, just take a look at this delicate and fiery tone and you’ll instantly understand why it’s so beloved. 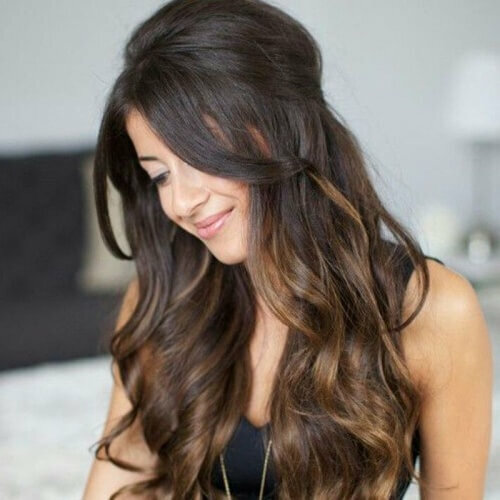 Caramel is easily one of the most endeared options when it comes to highlights for dark brown hair. Regardless if yours are chunky or wispy, this particular shade works the best for brightening any deep hair tone. Currently flaunting short dark locks? 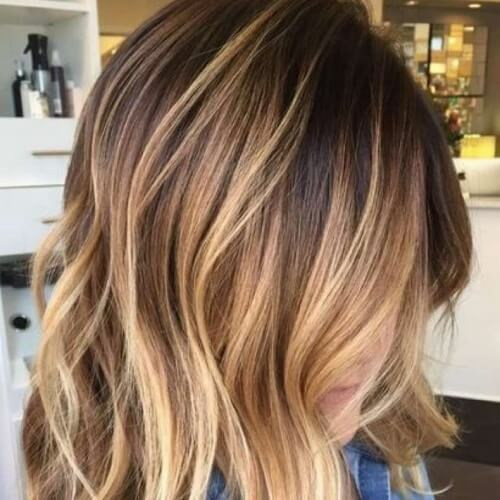 You should opt for a natural highlights tone to liven them up a bit. Whether you go for mahogany, chestnut or any similar shade, we encourage you to take a wispy approach to your highlights. Longing for a hairstyle that complements the shape of your face? That’s what face-framing highlights are exactly for. If you get blonde highlights like these on your brown hair, you will accentuate your facial features. It’s also a glamorous look to rock throughout the summer. 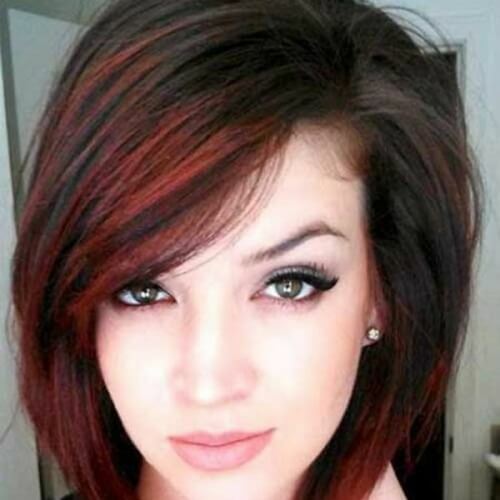 We’re back to the natural look for this example, with a magnificent shade of auburn for the highlights in discussion. You know that a hairstyle idea is banging when beautiful A-list celebs like Anne Hathaway sport it flawlessly. A splash of vivid color is just what you need to spice up your hairstyle. As far as red highlights for dark brown hair are concerned, there are two main options you can go for: bold or discrete. 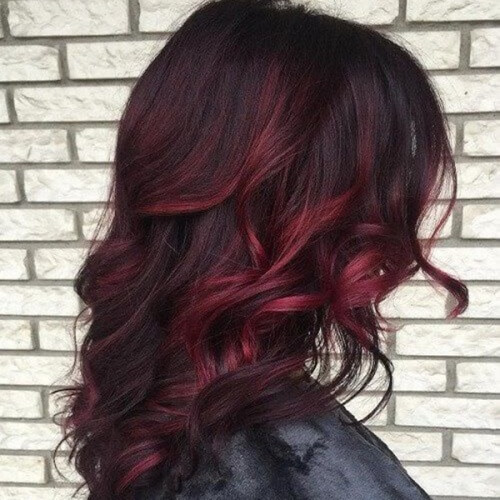 Here is how some eye-catching red highlights would look. By contrast, discrete red highlights result in a more natural look. Instead of providing a visibly colored look, they actually make it seem as if the reds are undertones of the base hair color. Go for the version that suits your personality the best. If you want to get even closer to your dark brown roots, chocolate highlights are undoubtedly the way to go. They serve as a warm and natural choice for accentuating your locks, allowing you to benefit from a hairstyle appropriate in all environments. While you can mix highlights and lowlights for your new splash of sunshine in your hair, you can also opt only for lowlights. This is particularly effective for accentuating the lower parts of your hair, and even more so if you have a layered haircut. Combining light brown with dark brown is as natural as you can get for a hairstyle with highlights. 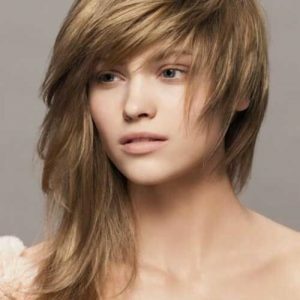 This is also a lovely idea for women who rock side bangs, as the highlights can draw attention to this area of your hair. For a cute, fresh and youthful look, regardless of your age, think about getting intense blonde highlights. This is a timeless look that started gaining popularity in the 90s and early 2000s and is still going strong today. Have naturally dark brown hair and pale skin? 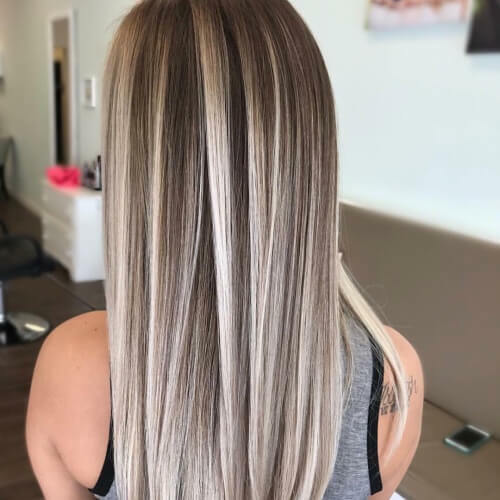 One of the best ways to bring your gorgeous natural features to life is to experiment with equally dark highlights, but in a different color. 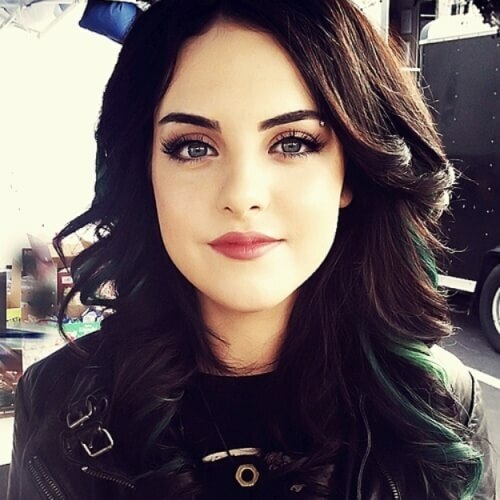 For instance, dark green is an excellent choice, especially if you have a similar eye color. This year, ash blonde and ash brown are all the rage. 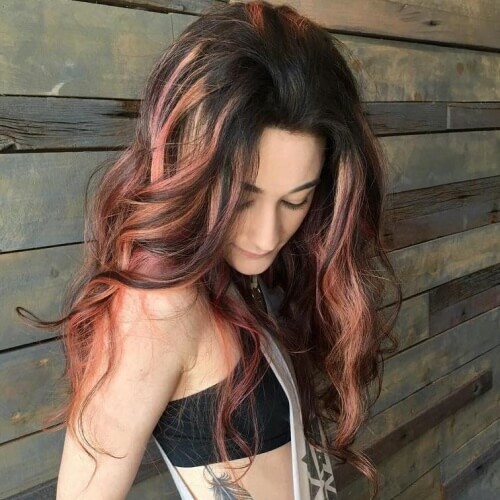 No matter if you get them as highlights or your main color, these tones are deliciously trendy and flattering for edgy and classy looks all the same. Moreover, they’re a dream come true for dark brown hair. 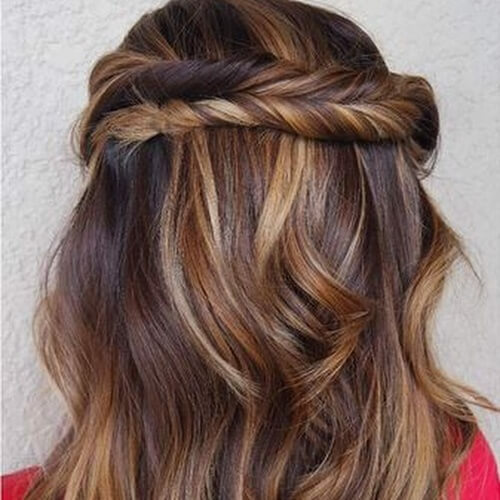 What if you’re in the opposite situation, looking for dark highlights to sprinkle throughout your brown locks? Well, if your base has a red brown tone, you shouldn’t hesitate to play around with dark accents. 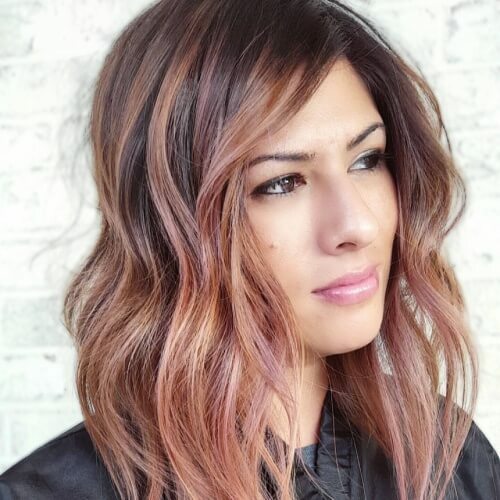 Just like ash blonde, rose gold is also a top hair trend this year. It truly is a lush tone, with accents of champagne blonde and peachy pink all around. For a posh yet confident look, don’t hesitate to play around with this delicate shade. 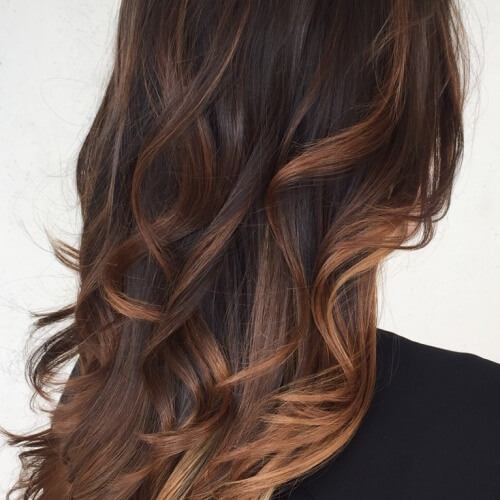 Why settle for one color when you can mix multiple shades for your highlights? The sky is the limit when it comes to your options, but one you can start with is shown in this shot. Rich tones of purple, copper, magenta and mahogany look amazing together. 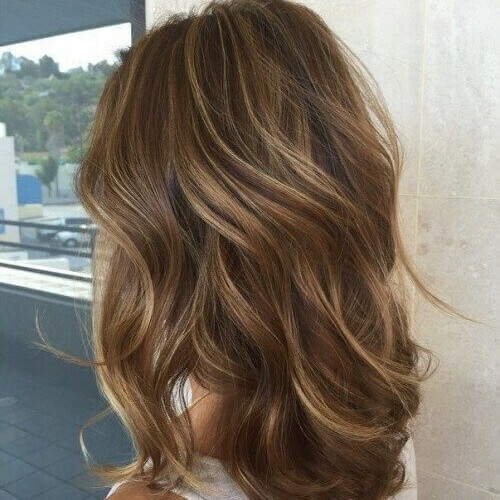 Not only are blonde highlights a prime choice for dark brown locks, but so are multiple tones of this sunny shade. In other words, go ahead and blend different kinds of blonde for a sublime color mixture to enhance your dark brown base. 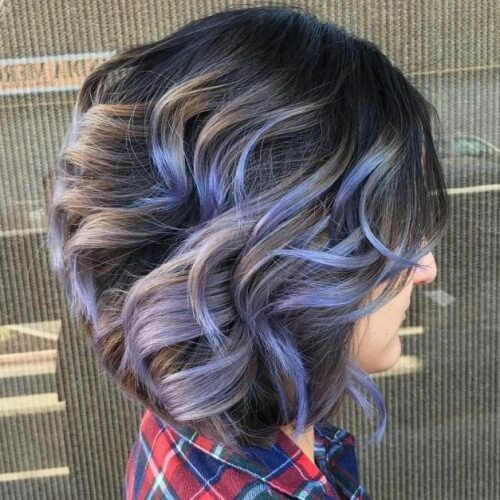 Purple is an enchanting color you can add to your hair. There are a wide variety of violent tones to choose from, starting with lavender and all the way up to plum. 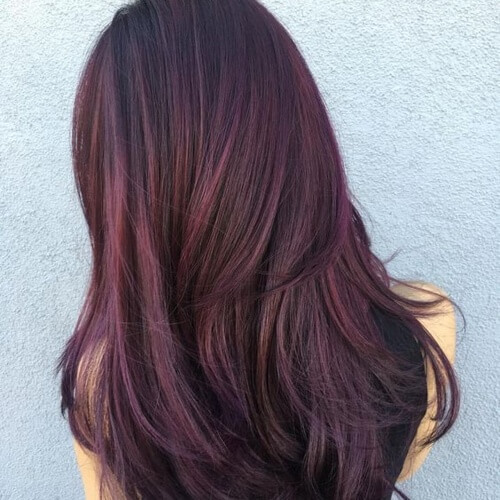 For this entry, we have chosen a rich plum tone to help you get a better idea of what it would look like. 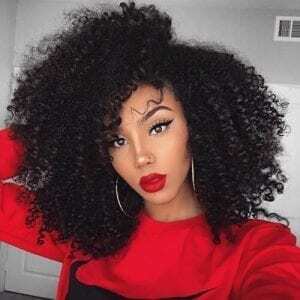 Generally speaking, highlights do a fantastic job of emphasizing individual ringlets for women with curly hair. If your aim is to get a boost of definition, think about natural highlights in chocolate or light blonde. 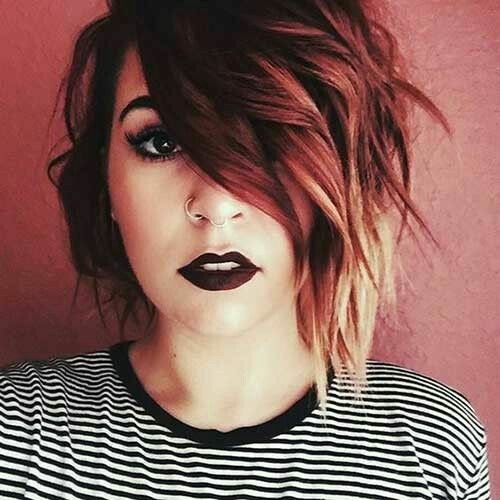 Dark brown and burgundy are a match made in heaven for hair color blending. The two tones go hand in hand, completing each other for a romantic and mysterious look. You should consider this mixture for an alluring look, regardless of your skin tone or hair texture. Darker skin tones look spectacular with deep brown hair with highlights. To get results that will leave an unforgettable impression, search for the tone that is closest to your skin tone for the highlights. The contrast will be phenomenal. We can’t get enough of charcoal, one of the hot trends that is closest to our hearts. Black and dark brown hair alike look radiant when mixed with charcoal highlights. Furthermore, you’ll get a boost of shine that no girl can refuse. We’ve solved the problem for our pale-skinned ladies, but what about our cuties with an olive skin tone? Natural is the way to go. 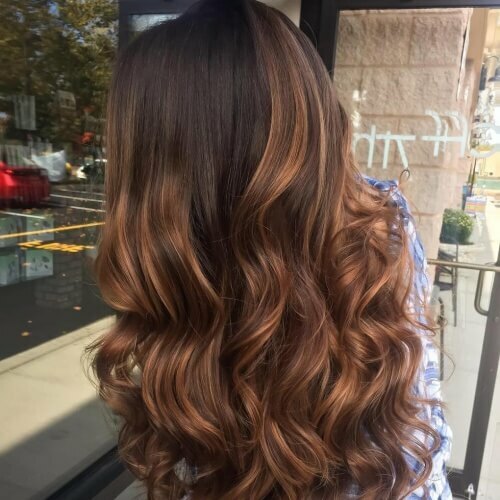 A popular option consists of getting mocha highlights, or a shade that resembles the tone of your skin as much as possible. 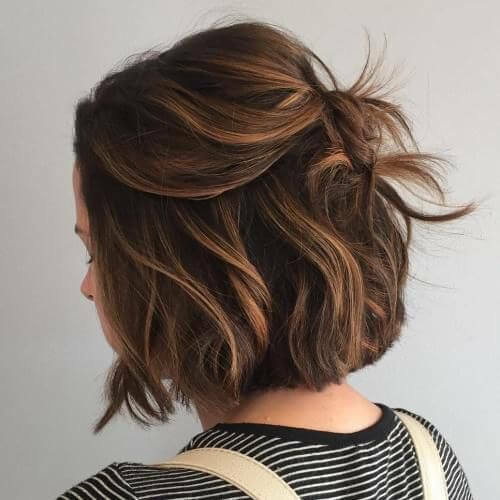 Now that we’re on the topic of natural highlights, let’s talk more about chestnut highlights for dark brown hair. Among natural shades, chestnut is one of the prettiest you can opt for regarding your streaks. The visual impact is stunning. Want to express your feminine side? How about bring out that girly girl you’ve been keeping trapped inside? One word can solve all your problems: pink! 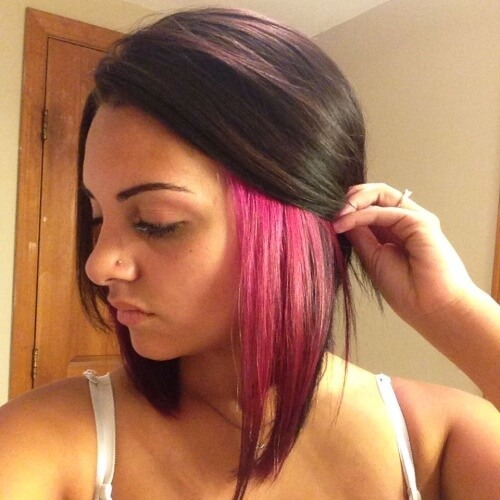 Dark brown hair looks enchanting with hot pink or cotton candy highlights alike. 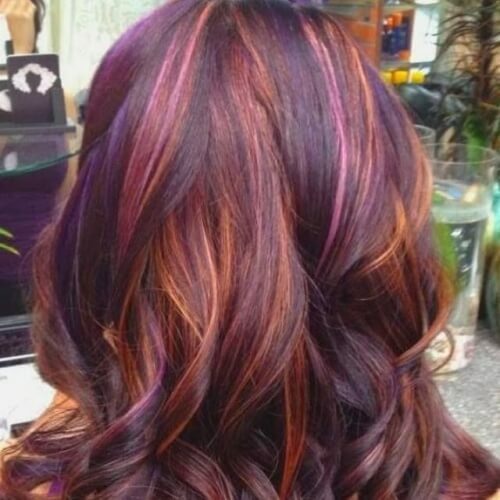 To resume our idea about purple highlights, here is the opposite of our plum example. 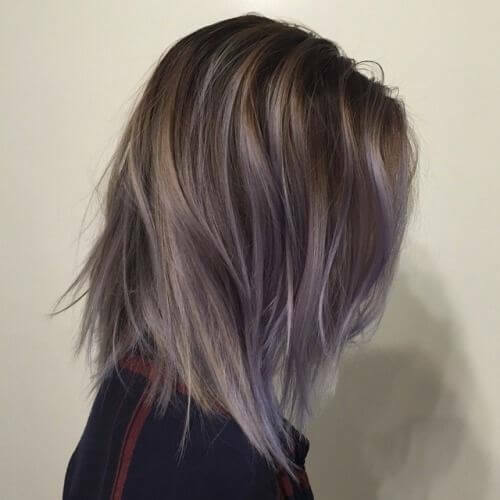 Like we explained, lavender looks just as remarkable against dark brown hair. To customize the look even more, add some light brown tones. 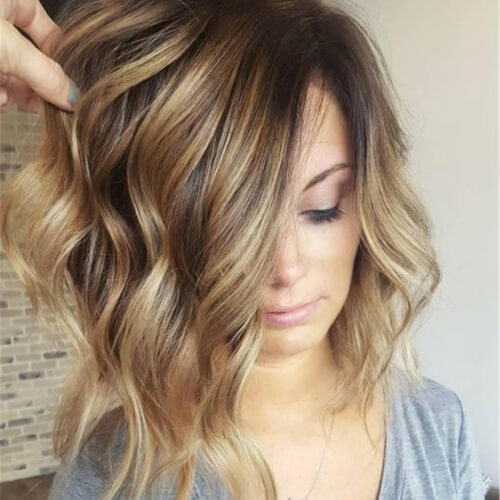 No matter whether you’re getting ready for a fall makeover or you just want to adapt the colors of this season to your hair, do it! You will enjoy that romantic vibe we described earlier, all through a natural and alluring hairstyle. 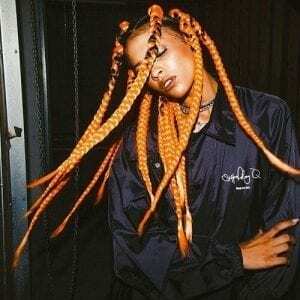 Are you genuinely aiming to stand out from the others with your hairstyle? Move all your highlights to a specific area of your hair. For an ultra cool look, consider getting a statement color like turquoise. You will get all the attention! What if your hair is really dark, like close-to-black dark? It’s all about the accents, darling. 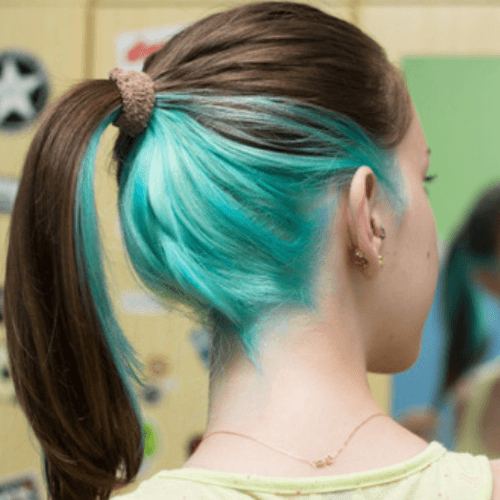 You already have an envious hair color, so all you have to do is make it pop. 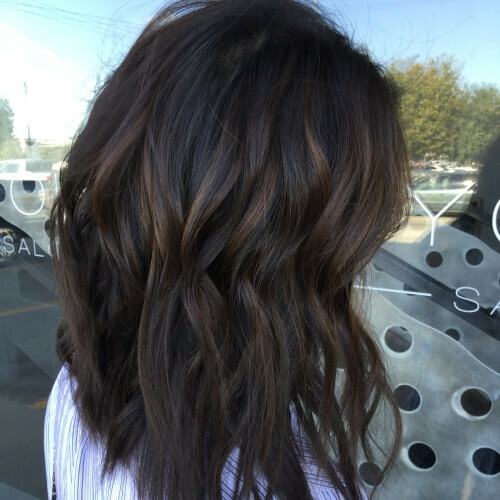 This is easy-peasy with a set of subtle intense dark chocolate highlights. Similar to rose gold, strawberry blonde or another other peach-inspired hair color is a flattering choice for your highlights. 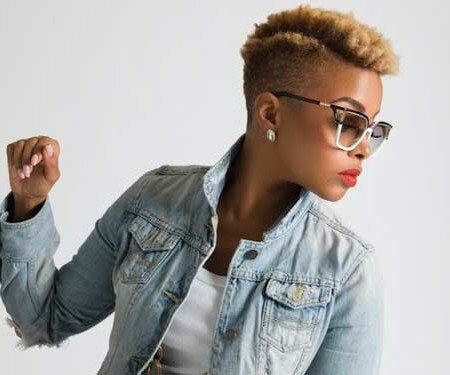 We particularly recommend it for spring or summer hairstyles, but it will be perfectly fine during other seasons too. 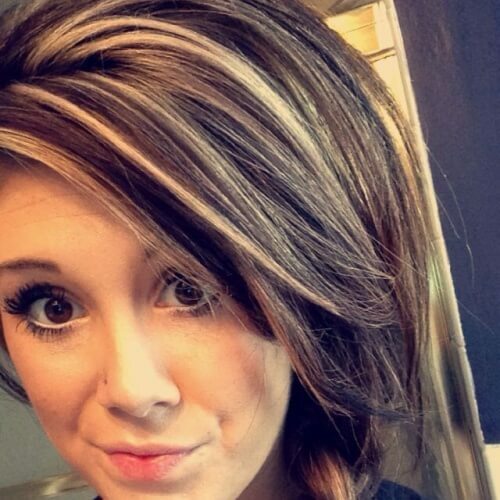 Can’t make up your mind between blonde or red highlights for your dark brown locks? Combine them! 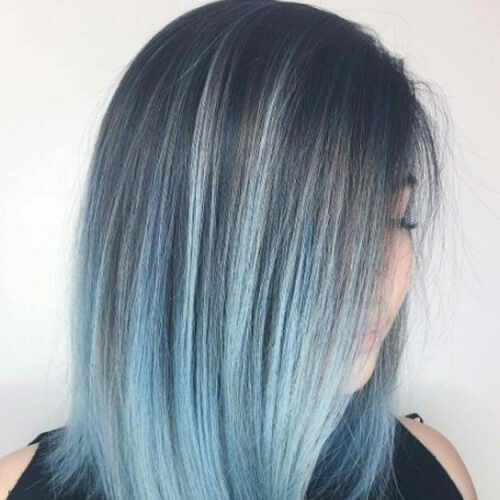 Don’t hesitate to experiment with colors, especially when it comes to achieving a hairstyle you won’t see everywhere you go. 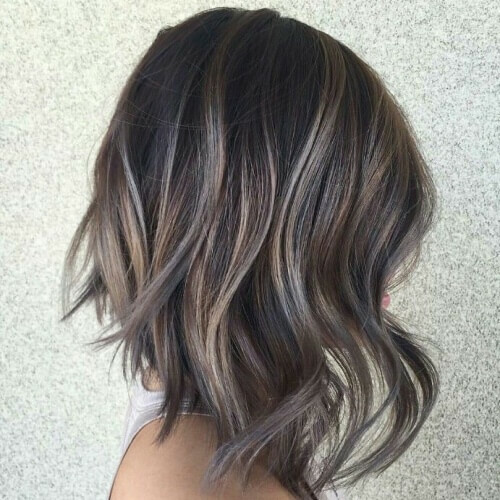 The layered haircut also boosts the impact of the highlights blend. 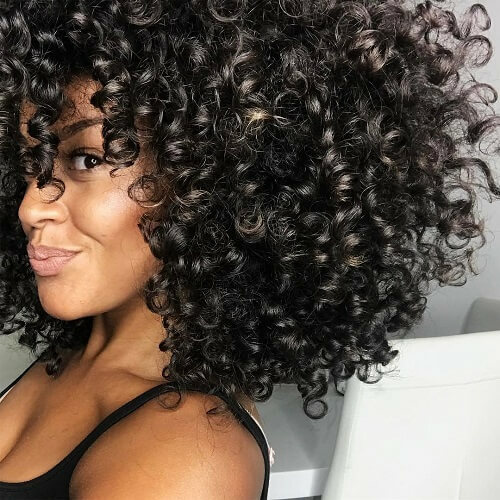 Our hearts melt every single time we come across afro-textured curls. These superb ringlets deserve to be accentuated accordingly, so don’t shy away from highlights. Define them with an icy or ash blonde tone for a jaw-dropping silhouette. 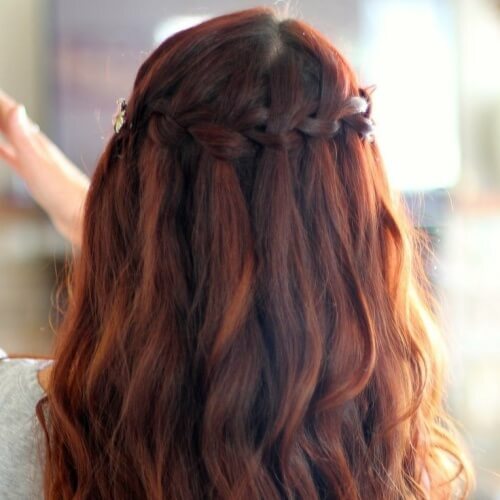 Dream of a mesmerizing hairstyle that will make you feel like a fairy princess? We’re happy to introduce you to periwinkle. If you haven’t heard of this color before, you should know that this superb pastel is predicted to trend for years to come. 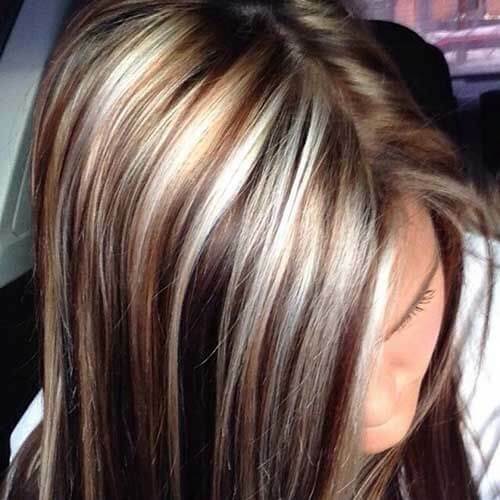 While some girls prefer a subtle approach to their highlights, others embrace an outgoing and flashy look. Lucky for us, chunky highlights are just as stylish as wispy ones; it all depends on your personality and how you rock them with confidence. Just like in the case of fall highlights, their summer counterpart can be nailed regardless of season. The main idea is to accomplish a sun-kissed look to brighten your appearance up. For this, be daring and bring on the blonde! Do you have a fiery personality? 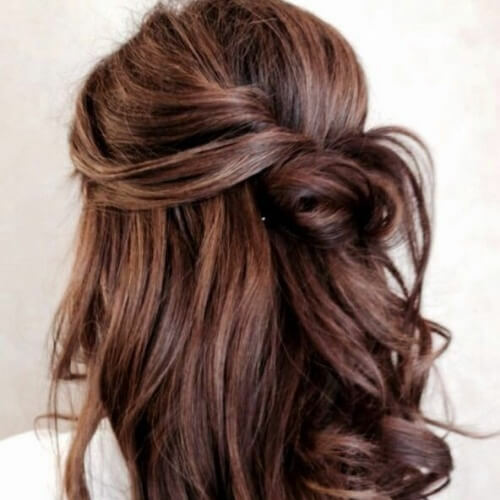 Show it through your hairstyle in sassy way! Get inspired by flames for the colors of your highlights, with shades that range from crimson to platinum blonde. Make sure they blend well to get the desired effect. You should never be ashamed of greying hair; it’s a natural process that should be wholeheartedly embraced. 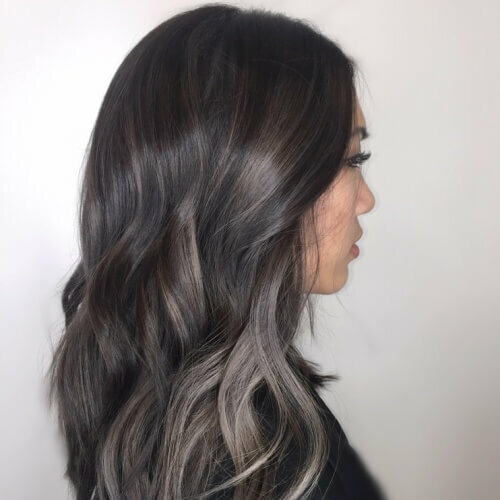 In addition, charcoal, ash and silver are some of the hottest hair color trends this year, so boost the grey instead of hiding it. We’re absolutely in love with peekaboo coloring, one of the cutest trends in the past years. As you can imagine, the colors literally peek out from beneath your base color in an adorable way. 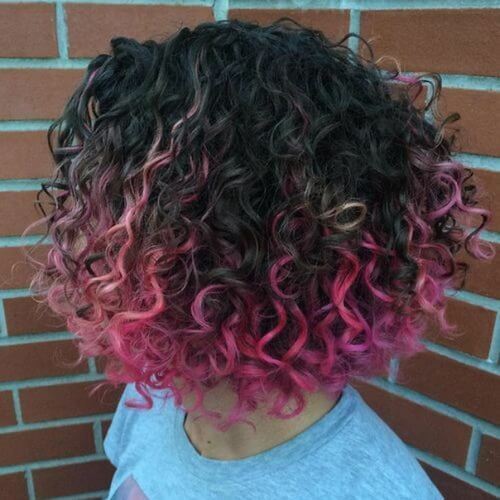 For dark brown, pink is a lovely color surprise for the hairstyle. 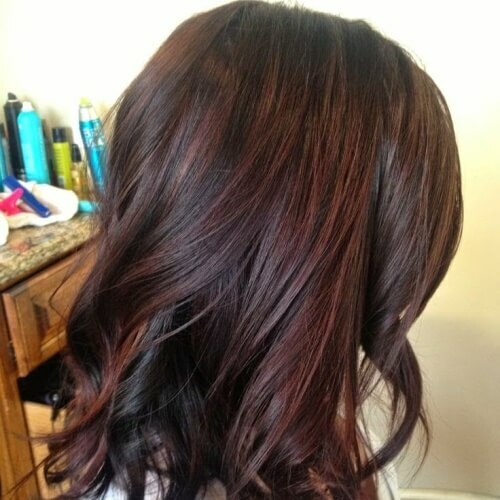 If you’re blessed with dark red-brown locks or have your hair colored this way, it’s best to highlight your red tones. In order to enjoy this effect, you should study similar tones that range from chestnut to mahogany or burgundy. Are you drawn to the idea of chunky highlights but are also curious about wispy ones? The great news is that you can rock both for your hairstyle. 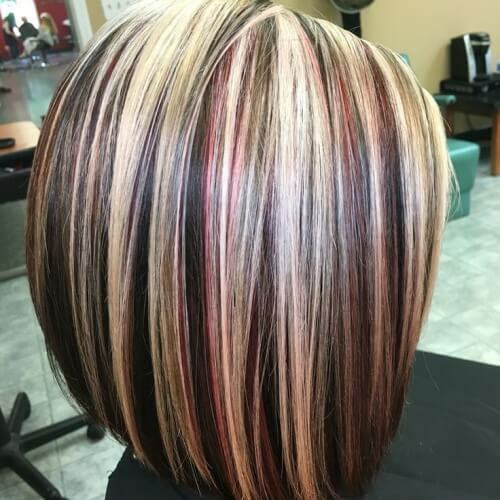 This example features chunky blonde highlights and wispy red ones. The results? A creative look you’ll fall in love with. “Go big or go home” isn’t a popular expression for nothing. We always encourage our fabulous readers to step out of their comfort zone with their hairstyle, especially when it comes to color. Platinum blonde is not only bold, but absolutely flattering for all women. For this example, we want to stress upon two terrific ideas for your makeover. Firstly, the pale green color used for the highlights is truly special. Secondly, the concept of frontal highlights has a major “wow” factor for your appearance. To make sure that your highlights are properly appreciated, you need to do some research on flattering hairstyles. 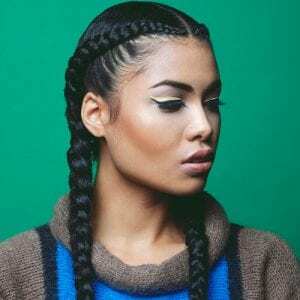 In almost all cases, braids will help you emphasize your new highlights. 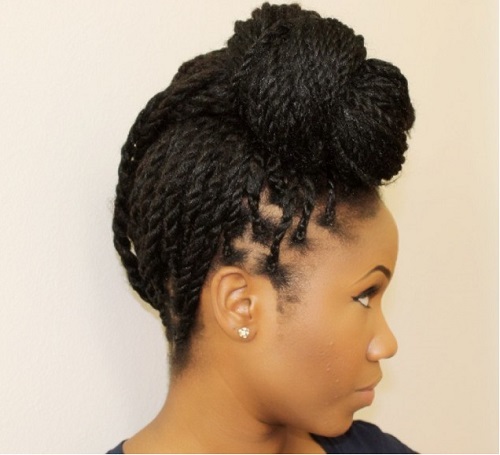 Take this half-up fishtail crown braid, for instance. For a tumblresque grunge look, pastels and metallic tones are the answer. In fact, you can combine these two qualities to get steel blue. 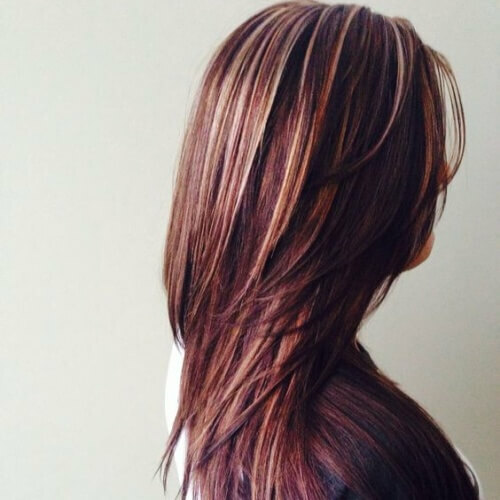 When paired with dark brown hair in the form of highlights, the impact will certainly be head-turning. Want a touch of glam? Accent highlights are what you need. To put it briefly, accent highlights and lowlights work to make the general color more pronounced. Let’s say that it’s a bit of spotlight for showing off the best in your base tone. 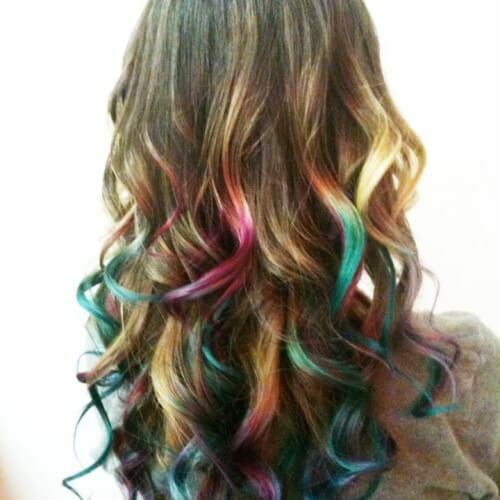 If you have a colorful personality, your hair can easily reflect your traits. Use your imagination to cook up the ideal color mixture for your highlights, using any shades you feel represent you. A complete set of metallic rainbow highlights is a cool way to start! 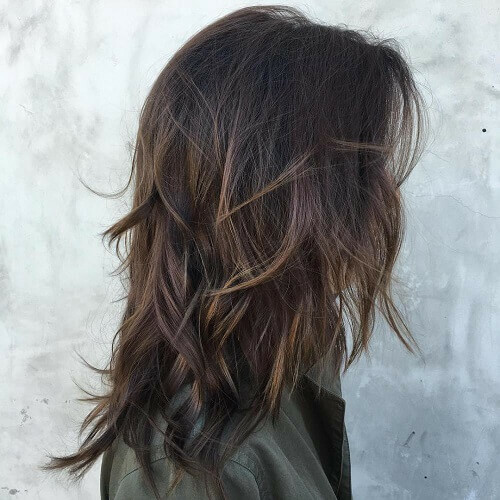 To top off our list of options for highlights for dark brown hair, we will end with an unconventional idea. Even though we typically associate highlights with streaks all around our hair, you should know that a handful can look just as marvelous. To sum up, highlights for dark brown hair are a small detail that can have a huge impact on your look. Whether you choose to go for natural accents or statement streaks, you should rock your new hairstyle with pride and a smile on your face. How about you? Which combo from our list was your favorite? Let’s chat in the comments!